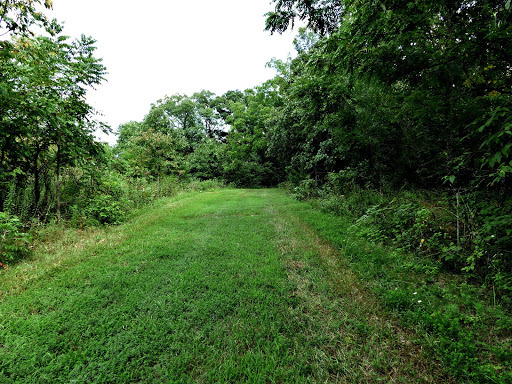 Part of the trail runs very close to the backside of a gun range. MDC logged some of the trees out of the woods between the gun range and the trails so, there’s less of a barrier now. 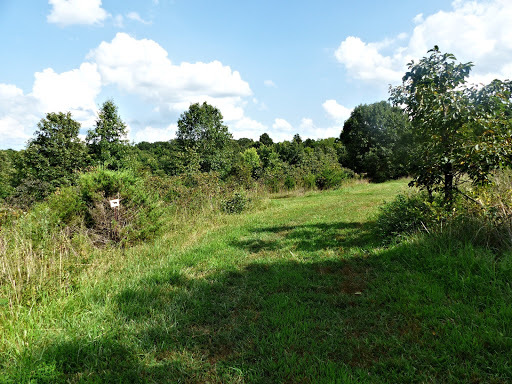 Not only can you clearly hear shooting, but it has been reported to me that there were bullets ricocheting and whistling in the trees close-by on the trail right behind the gun range. This area of the trail has signs saying you are on the edge of the gun range. You might want to avoid this section of the trail, or at least make sure your horse is used to the sound of gunfire and ricocheting bullets. 9 miles of multiple loops. 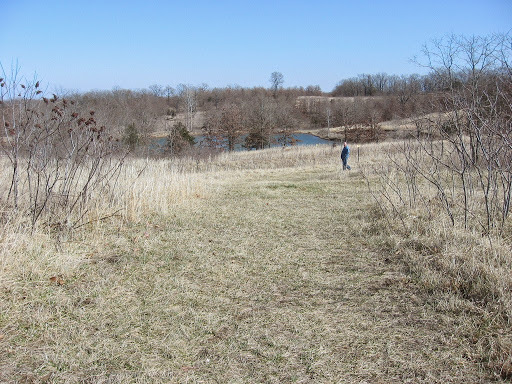 This trail is not difficult, however it goes through more fields than forest on the west side of the trail system, therefore it can be a very hot ride on a humid sunny day. It is mostly a very wide mown path of grass. There are a couple small creeks to cross, which are more like little ditches in the dry part of summer. 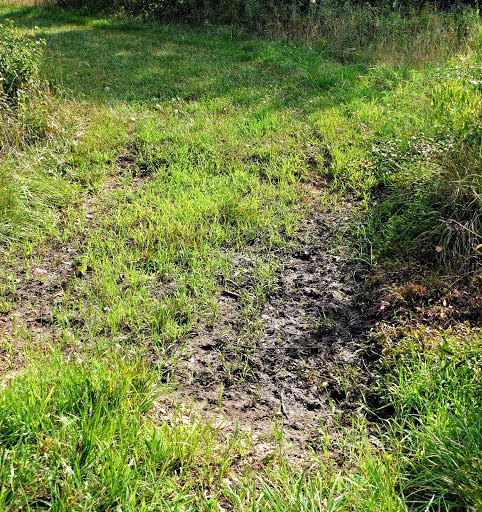 A few different places are eroded or have deep holes from being ridden when it was muddy. 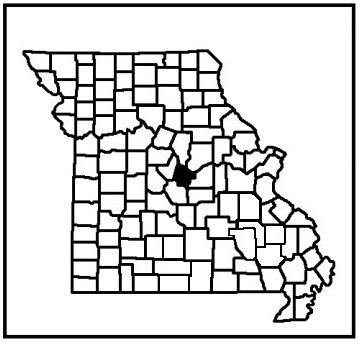 A lot of deer and turkey are in the area. 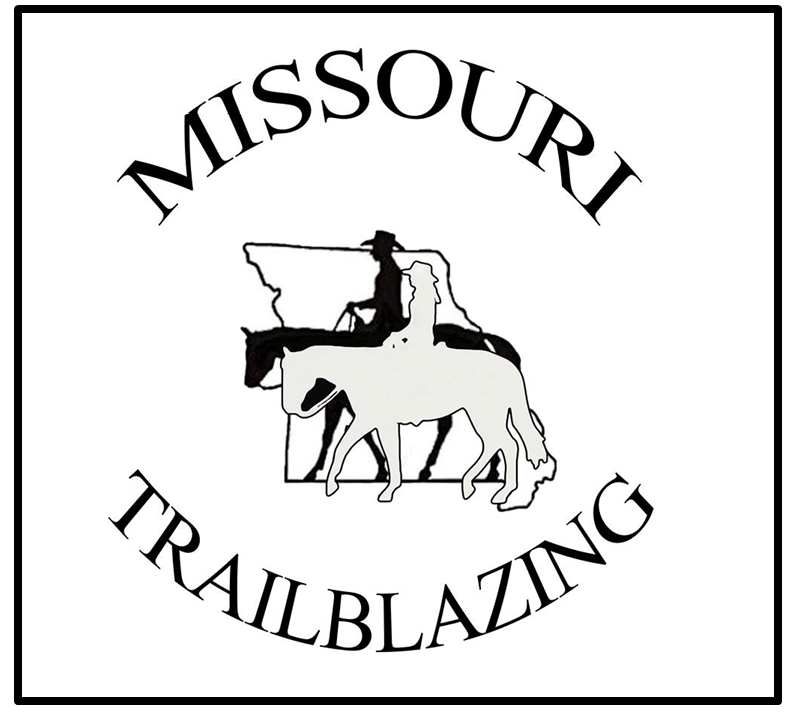 Several trails do not allow horses on them, however the trail is signed well and it’s obvious what trails you’re supposed to avoid. There is a good place to stop and rest in the woods, in the NW section of the trail-system near Claywell Pond. 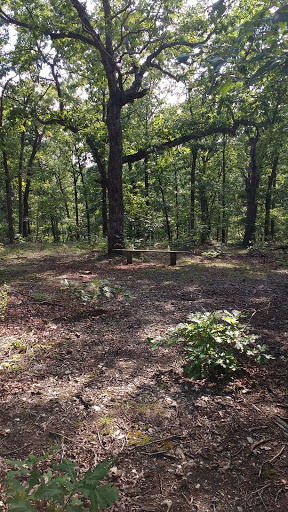 It’s a nice shady spot where someone put a bench on the west side of the trail. One nice thing I noticed about this trail is, it’s so widely cut, I didn’t go through one spider web across the trail anywhere. 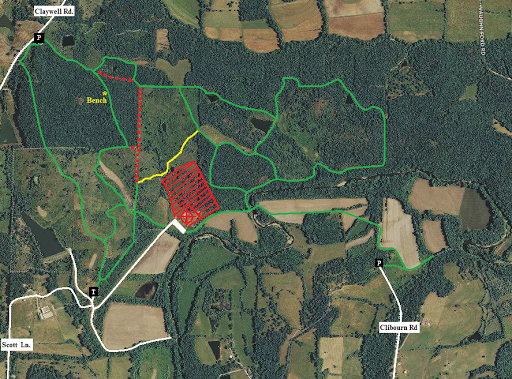 The green trails are trails equestrians are allowed on, the red dots are trails we are not allowed to ride on. 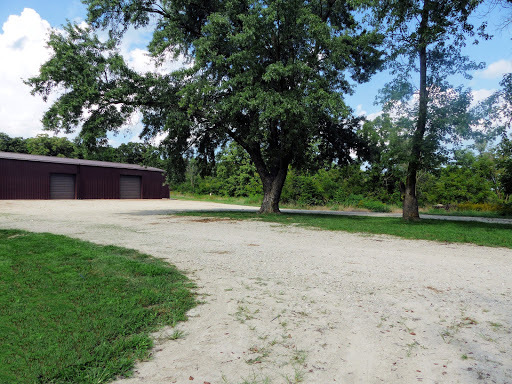 The trailhead lot that is best for horsetrailers is shown on the map with a “T”. 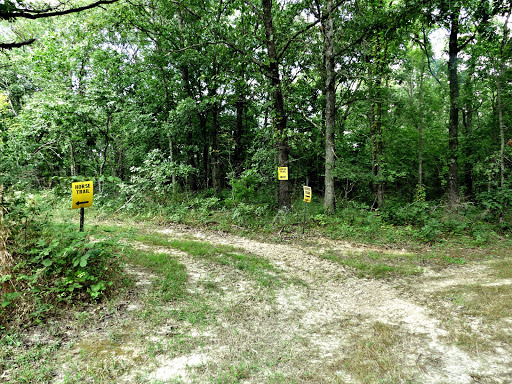 The gun range is shown with the red grid with the trail behind it, you might want to avoid, marked in yellow. Trailhead Parking lot. The trail starts back behind the building on the right. Much of the trail looks like this. A wide mown path. This pond can not been seen from the trail like this in the middle of summer because it’s so overgrown around it. Signage at a three way “cross-road”. This is where the trail enters into the largest of the 2 forested areas. Still a bit boggy in places even in the heat of August. 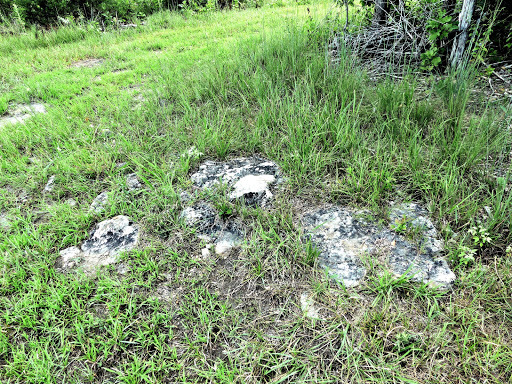 Rocky spots in the trail tread, dispersed here and there along the trail. Bench in the shady forest, great for a rest break. This is near the bench. 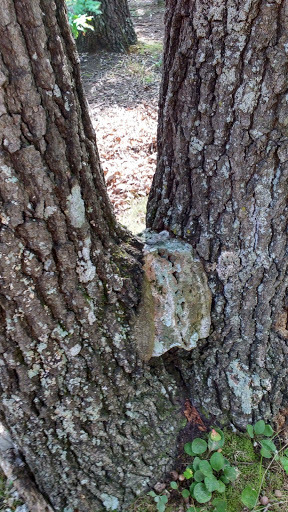 There are couple trees in this are that have a rock like this growing in the middle of the crotch of the tree. 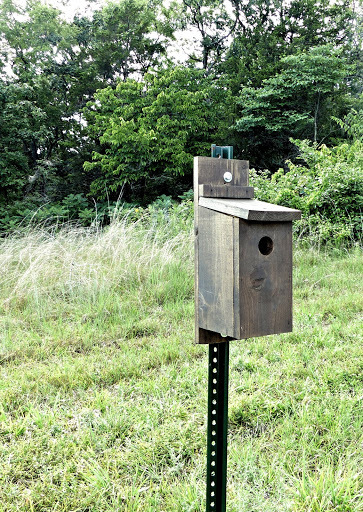 Just a birdhouse in the field. 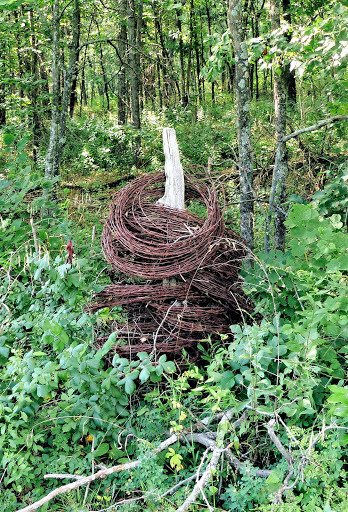 Anyone need some barbed wire? 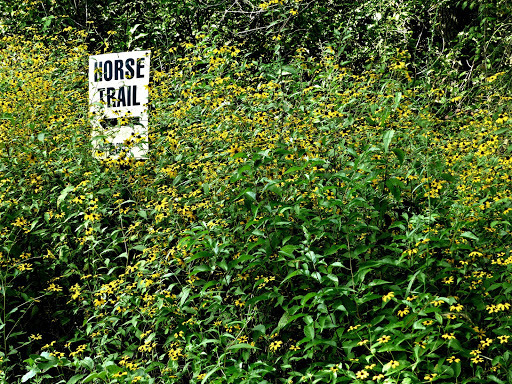 Tiny Black Eyed Susans are more yellow than the yellow Horse Trail sign.